On a cold February night, I shared a dozen and a half of oysters with my friend, E, at Ten Twenty Post in Darien, CT. It is a seafood restaurant that is filled with middle-aged folks and older folks. We felt a bit out-of-place. But no matter, we were there for the oysters. 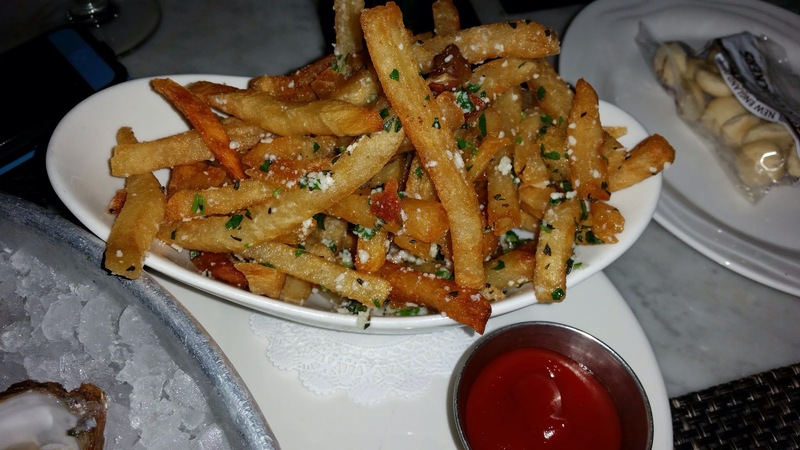 We started immediately with a dozen oysters and truffle fries. We started with the east coast oysters and made our way west. East Coast: There is the Raspberry Point, Irish Point,and Blue Point. The Blue Point won for me that night – with a nice combination of salinity and the taste of iron and mineral. West Coast: Pacific Orchard, Komo Gway, and Kumamoto. Surprisingly the Komo Gway was the best, surpassing the Kumamoto. The Kumamoto under-performed for being less creamy, meaty, and buttery. Just writing about this now brings me back the sensation of slurpping up the juices and swallowing the oysters. The oysters rarely disappoint. Usually, it’s the human that disappoints. This statement can pretty much be applied to everything in life. Machines vs. humans? Machine! Oysters vs. humans? Oysters! Many oysters we had that night were not shucked properly and contained a lot of shells. When we inquired politely about whether they had a new guy in the kitchen, the bar tender gave us real attitudes. This particular bar tender had a crooked face and seemed to think that he knows so much better than the paying customers. Truffle fries: E and I always order the truffle fries to go with our oysters. It’s a tradition she taught me. It slows down how fast I eat the oysters. It’s a pacer. By the time we got to dessert, we were still hungry. 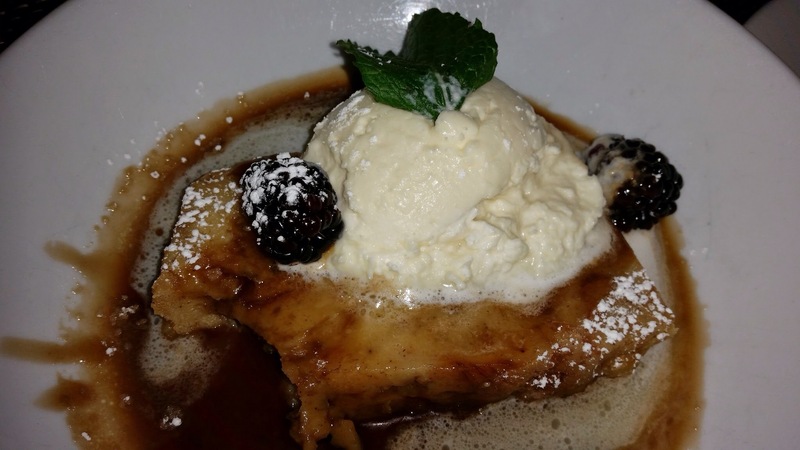 We had 1.5 dozen of oysters, two orders of fries and this bread pudding. Again, the mistake we made was asking the human to recommend a dessert. We went with the recommendation and it was terrible. Not too proud of ourselves, we still finished the dessert due to hunger. When the waiter asked how it was, we told the truth and were mocked. Both E and I were a little surprised at how rude he was. To the Management of Ten Twenty Post: We love oysters. We wanted to love your restaurant. But your staff was discourteous and your oysters were not shucked properly. We hope this post gets a high search engine ranking and shows up on all your organic search results. 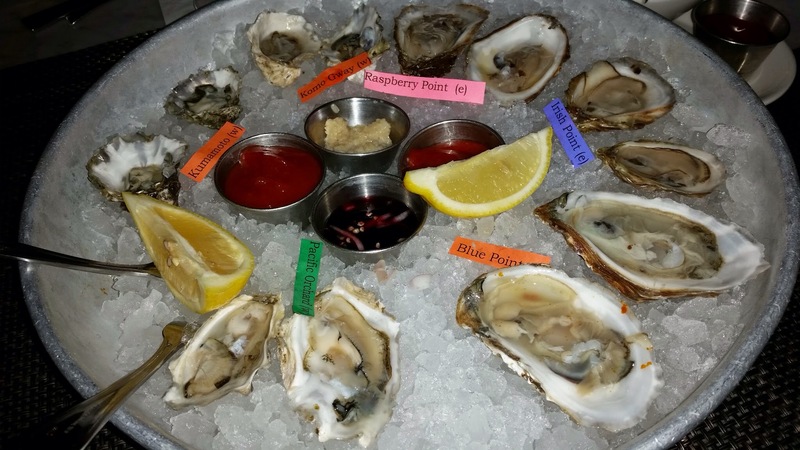 If your sister restaurant, Elm Street Oysters House can offer great service and oysters, so can you. And most importantly, the customers are always right. In conclusion, I profess my love for eating these little creatures. I just need to be careful where I go to fulfill my heart’s desire. It has been almost a month now. It is probably time for oysters again. Who is with me? Posted on February 24, 2015 February 23, 2015 Categories American, Cuisines, Darien, Fairfield, New York Metro, SeafoodTags bad oysters, Darien CT, Darien CT restaurants, Oyster restaurants, oysters, Seafood restaurants CT, Ten Twenty Post Seafood Restaurant3 Comments on Ten Twenty Post in Darien CT – Oysters! Oysters! Oysters!